This is one of the greatest Auguste Bonaz combs I have ever seen. I don’t even know what to say. For me, when I look at this, I see a mythical griffin with real ruby eyes, as in the English tradition, or a Japanese water-god dragon with real-gold accents, as in the Japanese gold maki-e tradition — or both! 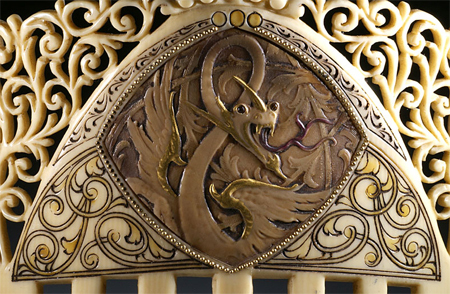 There are gold-button accents as a picture frame on the Art Nouveau part of the comb. Around that is an Art Deco celluloid design, which was cut on a comb-making machine in Oyonnax. This is a masterpiece. I think any museum thinking of doing an Art Deco exhibition could make this Bonaz a centerpiece, and viewers would gasp. 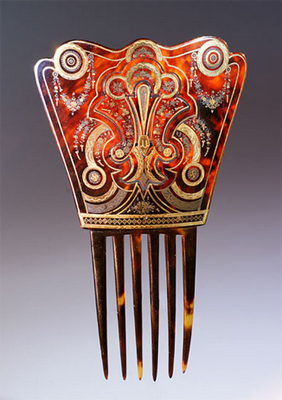 I will date this comb as late Edo / Early Meiji. It is painted lacquer with a sumptuously colored tree with red and gold berries or buds. 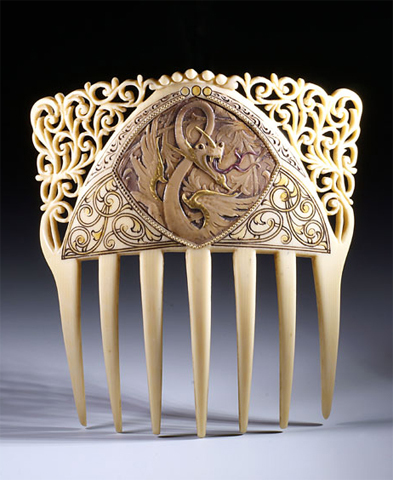 The tines are also painted gold, and the comb is signed. I can’t wait until they create their own photographs of it. 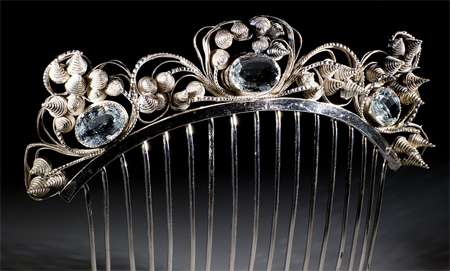 What makes this French Empire comb special is the combination of design elements: cones made out of wrapped silver wire, cut steel “jewels” dotting the silver frame, and clear aquamarines. 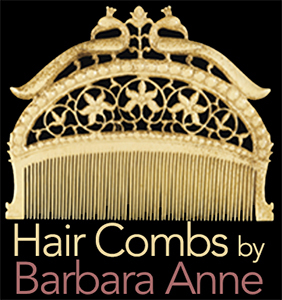 The comb is imaginative, unusual, original, and an unknowingly prophetic nod to modernism. Marquetry is the furniture maker’s and jeweler’s craft of applying pieces of veneer onto a smooth surface. 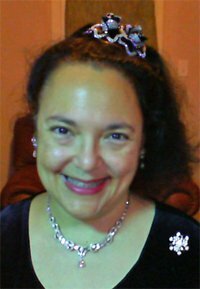 This technique allows the artist to create pictures and sumptuous designs. 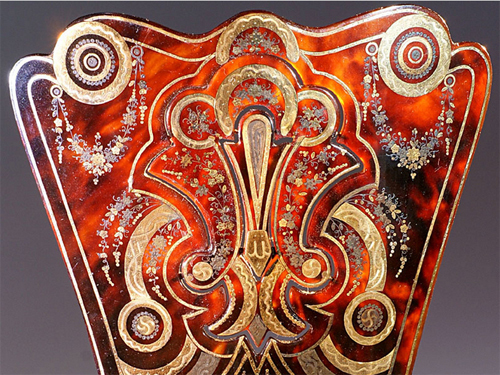 In this early 19th-Century comb from Russia, a master jeweler used gold marquetry to create delicate garlands amid thicker gold circles and arches on tortoiseshell comb. This kind of taste and buying ability, combined with writing and photography, is what makes a museum. Bravo. For more scholarly research, please see the publications and exhibits of the Creative Museum, as well as the books in our Resource Library.